In the year of 2005 the first Human Security Report documented a decline in the number of wars, genocides and human rights abuse over the past decade. However, in the 2008 edition of the biennial report Peace and Conflict, new evidence suggests that if there was a global movement toward peace, since the end of the Cold War in the 1990s and early years of the 21st century, it has stalled. New challenges point to a conflict syndrome - a sum of factors that often operate in conjunction to undermine the stability of states and the foundations of human security. In fact, human-induced climate change is already taking place and it’s not very difficult to find press warnings of climate change causing violent conflict. The question is: is the world facing a new era of war? Researchers from the Department of Geography at the University of Hong Kong reported, in July 2007, that cool periods in China and the resulting scarcity of resources, such as shrinking agricultural output, are closely linked with a higher frequency of wars over the past 1000 years. - War frequencies showed a cyclic pattern that closely followed the global paleotemperature changes. - Reduction of thermal energy input during a cold phase would lower the land carrying capacity in the traditional agrarian society, and the population size, with significant accretions accrued in the previous warm phase, could not be sustained by the shrinking resource base. - War frequencies varied according to geographical locations (North, Central and South China) due to spatial variations in the physical environment and hence differential response to climatic change. The research shows that human population increases and collapses were correlated with the climatic phases and the social instabilities that were induced by climate changes during the last millennium. The findings proposed a new interpretation of human-nature relationship in the past, with implications for the impacts of anomalous global warming on future human conflicts. 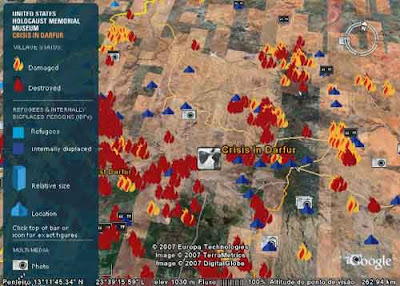 A 2003 report prepared for Pentagon years ago explored the potential consequences of an abrupt climate change and concluded that it would create serious food shortages due to decreases in global agricultural production, decreased availability and quality of fresh water and disrupted access to energy supplies. This would result in large population movements and an escalation of global conflict. The “Abrupt Climate Change Scenario” report warned of the need to strengthen US defenses against "unwanted starving immigrants" from the Caribbean, Mexico and South America. Such kind of strategies usually claiming their pragmatism and appealing, intentionally or not, to security, fear and other emotional or irrational issues , could have negative consequences, undermining the role of civilian institutions in the search of democratic and sustainable solutions. This unprecedented online mapping initiative from the USHMM and Google Earth lets you visualize, better understand, and respond to the genocide in Darfur. The conflict and resulting tragedy that have unfolded in Darfur since 2003 have taken the world headlines. The most common way of explaining the context was in terms of ethnic differences between Arabs and Africans. Actually, the Secretary General of the United Nations, Ban Ki- Moon, believes that we are already seeing in Darfur a violent conflict caused by climate change - "the Darfur conflict began as an ecological crisis, arising at least in part from climate change". small arms proliferation and youth militarisation; bad government agricultural policies and weak state institutions. Thus climate change alone (or drought and land degradation caused by it) does not explain either the outbreak or the extent of the violence in Darfur. The other 16 countries in the Sahelian belt have felt the impact of global warming (including Mali and Chad), but only Sudan has experienced such devastating conflict. Darfur is, in fact, an exemplary case showing how the physical consequences of climate change interact with other factors to trigger violent conflict, like the nature of power structures at the local, regional, national and international levels. Climate scare stories don’t take into consideration the forms used by many poor communities to peacefully manage their affairs. Generally, violent conflicts in the South are more related to resource abundance than resource scarcity. An example is the competition over rich mineral reserves in the Congo or diamonds in Sierra Leone. The IPCC’s Fourth Assessment Report of 2007 shows that global warming will have global effects, varying in both kind and degree. Second the research for this report, the consequences of consequences of climate change include a high risk of armed conflict in 46 countries with a total population of 2.7 billion people, and a high risk of political instability in a further 56 countries with a total population of 1.2 billion - a total of 102 countries as being at risk of significant negative knock-on socio-political effects. The 46 countries identified as facing a high risk of armed conflict have current or recent experience of armed conflict and additionally, particularly weak institutions of government and very poor economic performance. Another example showing that environmental scarcities and massive population movements do not always result in violent conflict was Malawi, which has been suffering from massive famine but no war has followed. Also, the Asian tsunami of 2004 created huge refugee problems but did not lead to violent conflict. Why not? The answer lies in “intervening variables”. 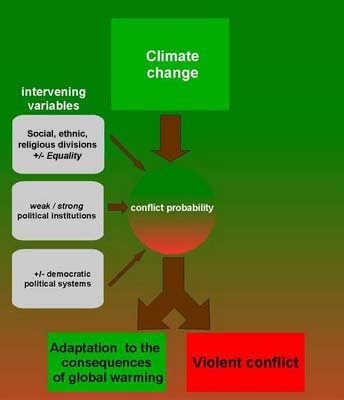 Environmental scarcities do not directly cause violent conflict, but the outcome depends on social and political factors that impact on the potential for violent conflict - some variables increase and others decrease conflict probability. 1 - the deeper the divisions between ethnic and religious groups or between classes are, the more likely it is that environmental scarcity causes violent conflict. 2 - states with weak political institutions are particularly vulnerable, since they find it difficult to manage the social tensions caused by climate change. 3 - democracies are better able to protect the environment and manage peacefully the consequences of environmental degradation. A better understanding of climate change requires an interdisciplinary knowledge in astronomy, physics, geology, chemistry and biology. The observations from Space are crucial for this, but the economic and social sciences also play a fundamental role. And effective solutions to this urgent problem only can be obtained in peace by international collaboration. So we have a Gordian knot of sort: climate changes will create wars of survival, but those wars of survival will create chaos and will mean that we will not be able to cooperate and therefore we will be able to survive and will be doomed to extinction. Logically, one has to conclude that without peace there will be no survival, but to create peace one needs justice first. Sounds like Plato’s Republic. But are the politicians and the war mongers thinking about peace and justice and the solution to these dilemmas? That is doubtful, but man has been in danger of extinction before and he may still find a way out if he figures out how he made it the last time around. Plato’s solution was to put wise men in charge, but will the war mongers allow that to happen? It does get complicated, and the more we debunk the study of our own history, the more complicated it will get. Anybody considered meditation and prayer? If you are guffowing at the suggestion, you may be part of the problem and not part of the solution. There is a decline of wars? WHAT ARE THEY SMOKING!